OMG Posters! 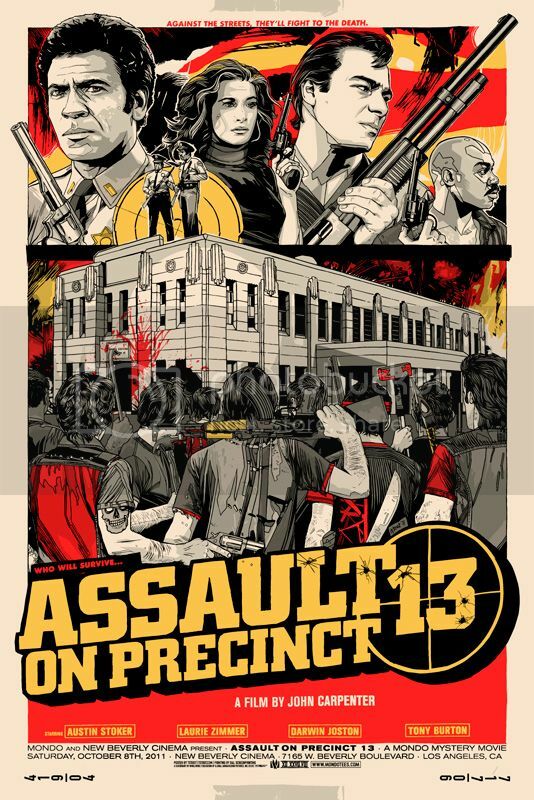 » Archive Tyler Stout's Assault On Precinct 13 Poster (Onsale Info) - OMG Posters! Mondo will release the main version of Tyler Stout’s Assault On Precinct 13 poster tomorrow (note the image change here, this is the official, final image). It’s a 24″ x 36″ screenprint, has an edition of 450, and will cost $50. It goes up tomorrow (Friday, November 11th) at a random time. Visit Mondotees.com. I think it is a coin toss between which version I like better. I actually like this colorway a lot more than the one created for MMM. I didn’t even want this poster until I saw this new color scheme. Totally agree. I don’t know that I’ll be trying to purchase one tomorrow, but I’ll definitely be attempting to trade my Mystery Movie variant for a regular. In for the flip (if I remember). Crumbs that was quick! I swear less than a minute and I lost out. Scored one. Sweet, normally I miss out on Stout. Kinda stoked I copped this one. Just missed out on getting one. Any advice/strategy as to how to ensure that I get a poster next time?